Leading timeshare brand Diamond Resorts International® has raised well over €6,000 from a series of charity walks in the UK and in Spain. 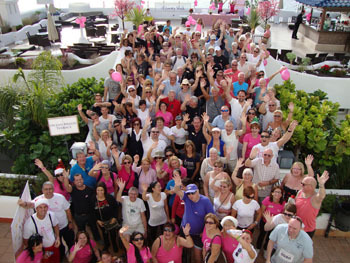 In December 2011 Diamond launched its first Charity Walk in Costa del Sol as well as organising walks at most of the brand’s UK resorts; last December, it raised the impressive total of 5,111€ (Europe) and £918 (UK) for local charities in various regions where it owns and operates luxury holiday resorts. Support for the charity initiatives was fantastic – no less than 25 different resorts in the UK, Ireland, France, Austria, Italy, Spain (including Mallorca and the Canary Islands) and Portugal took part in various fundraising efforts, and in total 633 walkers registered. The walks were designed for all fitness levels and ages, too, so that everyone could help boost the fundraising efforts. After finishing their charity walks, all participants were treated to a cup of hot chocolate, coffee and biscuits, followed by a prize raffle. Those resorts unable to organise a walk because of unfriendly weather even held a fundraiser within their own resort, including raffles, special breakfasts and evening events to raise money for their local charity of choice.